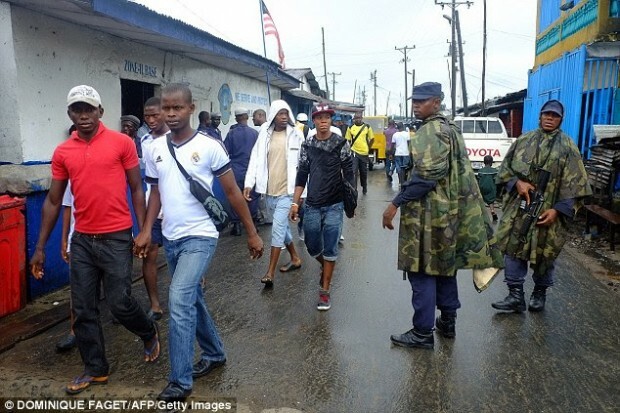 Liberian soldiers patrol in Monrovia’s West Point slum. Thousands of UK troops would be sent to Sierra Leone to enforce a military lockdown under radical plans to defeat ebola being considered by Britain’s most senior Army officer. General Sir Nick Carter is leading a review of the UK’s response to the virus, and could use 3,000 British soldiers to impose a blockade and restrict human movement in the African country. Sir Nick, the Chief of the General Staff, will advise Ministers on proposals, including an increase in troop numbers and using Royal Navy ships to patrol its coastal waters. The top-level review comes as charity Oxfam said a critical shortfall of Western military personnel in West Africa was in danger of putting lives at risk. It wants troops to deliver vital supplies and build treatment centres for victims.